We are what we drink—and in the case of most adults, water makes up 60-70 % of our body weight. As we recognize National Drinking Water Week in the United States, it’s important to recognize how vital water is for the proper function of virtually every cell, tissue and organ in the body, and is needed for proper digestion and delivery of nutrients to your cells, and to help regulate body temperature. Water also acts as a “shock absorber” for the brain and spinal cord, and it lubricates joints, organs and tissues. And adequate water intake may even help you manage your weight. 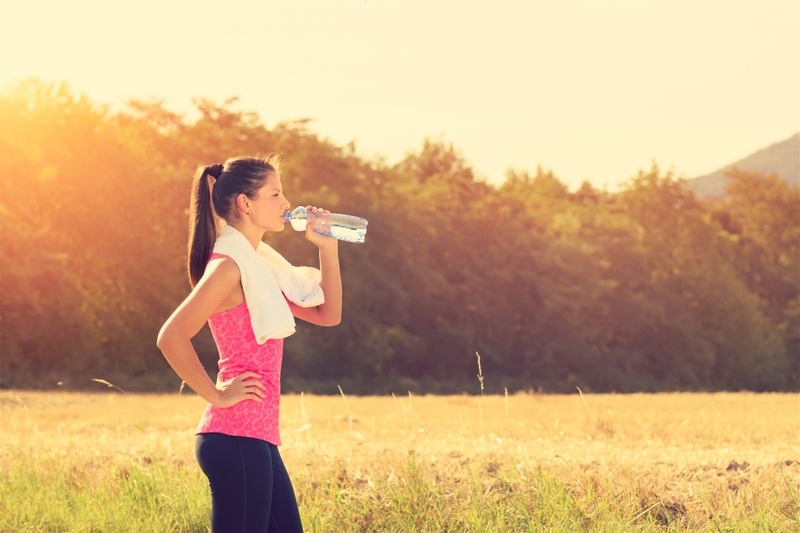 Of course, your age, size, gender and physical activity level will help determine your water needs, as does the climate (when it’s hot and dry you need more, when it’s rainy and cold you need less). As a general rule, according to the Institutes of Medicine, the recommended daily fluid intake is about 11 cups for adult women and 15 cups for men. That sounds like a lot, but not all of it needs to come from beverages alone. About 70-80% should be provided by beverages (and at least half of that from water, with lesser contributions from tea, coffee, milk and other beverages); the remaining 20-30% should come from watery foods such as fruits and vegetables. You’ll also need extra water when you’ve had diarrhea or vomiting, if you’re running a fever, or if you’ve been physically exerting yourself. When you’re not properly hydrated, your body sounds an alarm that shows itself first as thirst and dry mouth. Signs that you may not be taking in enough fluid might include dark urine, constipation, bad breath, muscle fatigue and headaches. But by the time your thirst mechanism kicks in, you’re already fairly dehydrated, so it’s important to stay on top of your fluid intake during the day. It’s also critical to make sure infants and small children get enough fluids as well—a 2015 study showed that half of the nation’s children are under-hydrated. Many people wonder if drinking coffee and tea counts toward hydration goals or against them. The good news: Moderate amounts of caffeine will not deplete the water in your body, studies have shown. But watch the calories in those fancy coffee drinks – large amounts of cream and sugar add-ins can rack up calories quickly. Start your day with a big glass of water before your coffee or tea—you’ll create a good habit that can last a lifetime. Review the situation at work—are you drinking enough during your workday? If you tend to spend a lot of time at your desk, set a pitcher of water on your desk each morning. It will serve as a reminder to drink more, and you’ll be motivated to sip on it as the day goes by – and meet your goal of finishing it. If you’re on your feet or in the field, make sure you have convenient access to water (or bring it with you). Make it interesting: Add in citrus, herbs, fruit or a splash of juice to amp up the taste; go for a bubbly, unsweetened option; have some tea with lemon; keep a pitcher in the fridge for a nice icy blast on a warm day; try using a straw, which often encourages you to drink more. Whatever way you choose to stay hydrated, even a little bit more water on a daily basis can make a big difference.